PERSONAL USE MODELS CR2, CR3: Open the cleaning tray and place the white cleaning pad in the larger half of the tray. Fill the cleaning tray with sterilisation solution and roll the roller into the pad with medium pressure. Leave the MTS Roller in the cleaning solution for about 15 to 30 minutes – ensure that the roller drum is constantly wet with the cleaning solution. 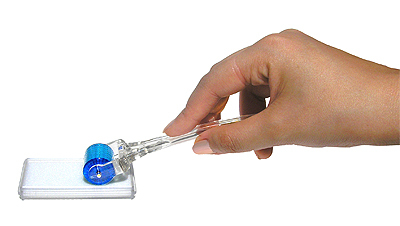 After cleaning, rinse with tap water and return the roller to the protective case and allow it to air dry. Replace the case lid until the next use.